The Varicose Veins Treatment in India is done to stop the flow of blood back into the legs by surgically destroying the varicose veins. Surgeons and other medical practitioners in India stand #1 in their respective field. Our hospitals have state-of-art equipment that increase success rate of treatments. Tour2India4Health is a medium to make these immaculate services accessible to patients from any corner of the world. We offer low cost varicose veins treatment at the best hospitals in India. Primary formalities: Arranging visas, accommodation, appointment with top doctors for stem cell therapy in India by Tour2India4Health Team. Professionalism: Utmost care taken in selecting best suitable therapy by best of the medical fraternity, ensuring fast recovery. Special packages: Find varicose veins treatment in India at the best hospitals from the best doctors that suit your budget so you don't have to put your health at stake. Surgical services: Arrangement of transportation, pre-surgery tests, medications, stay options for kin, health food as prescribed by attending doctors. Other vital services: Quick visa letter, flight ticket bookings, languagtors, foreign exchange facility, hotel arrangement. The condition is usually the result of problems with valves within the veins of the leg. When one or more of the valves fails to close properly, the veins conduct blood back into the leg instead of up to the heart. As blood accumulates, abnormal pressures dilate the superficial vein system, causing the veins to bulge and become visible. Approximately 25 percent of women and 15 percent of men in the United States have varicose veins. The condition is usually the result of problems with valves within the veins of the leg. 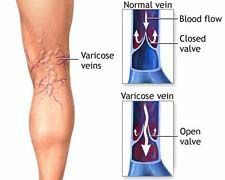 When one or more of the valves fails to close properly, the veins conduct blood back into the leg instead of up to the heart. As blood accumulates, abnormal pressures dilate the superficial vein system, causing the veins to bulge and become visible. The tendency to get varicose veins is commonly hereditary and occurs more commonly in women than men. Depending on the severity of the condition, initial treatment is usually a compression stocking worn while the patient is up and about. The stocking may relieve the symptoms and delay the progression of the condition somewhat, but does not cure the underlying problem. The definitive treatment is to stop the flow of blood back into the legs by surgically destroying the varicose vein. While patients often try to ignore varicose veins treatment is important to prevent dilated, twisted veins, episodes of aching pain, and leg ulcers on the surface of the skin. If left untreated, varicose veins can lead to more serious complications. Early treatment is highly recommended to help prevent the varicose veins from becoming very advanced. The old technique for Varicose Vein treatment was known as the hook method, a painful and less effective method that actually is still in practice in some areas. There is a new advanced technique called The TriVex System, being practiced in Los Angeles by Doctor Marius Saines, offering patients a minimally invasive procedure allowing patients to be virtually pain free within a couple of weeks. The Trivex System makes varicose vein removal more effective and less traumatic for the 24 million Americans suffering from them, by reducing the number of incisions required to perform the procedure, which not only reduces the pain associated with varicose vein removal, but also reduces the potential for post-operative infection. The varicose vein surgery is generally performed in less than one hour. The TriVex System uses a unique illumination feature that lights the area beneath the skin so the vein is clearly visible. This allows the surgeon to quickly and accurately target and remove the vein and then visually confirm its complete extraction. 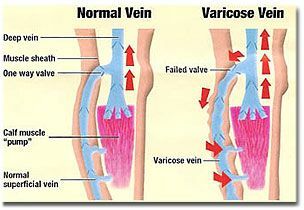 The cause of varicose veins are either broken valves in the main superficial vein system or the vein communicating with deep veins in the leg. Its important to differentiate between the types of varicose veins because the treatment for varicose veins is different for each. Varicose veins are not something that happen overnight. Usually it takes years for them to develop to a stage where symptoms occur. Varicose veins are commonly inherited although its important to note that anyone can get them. Often times varicose veins are common in people who have had certain types of injury to the leg or an episode of deep vein clots. Varicose veins became more frequent as more people in todays society began working standing still or sitting down, which in turn deprived their veins of regular circulatory flow of the leg muscles. Lack of exercise, restrictive clothing, weight gain can add to the strain on the veins. In the first two categories it is important to treat the source of the problem otherwise varicose veins will recur. For incompetent saphenous veins the procedure of choice is ligations stripping from the groin to the knee. The vein can be occluded (blocked) with laser or radiofrequency, but the groin branches in this case will be left open so the recurrence rate is higher. For the incompetent perforators the minimally invasive procedure is called SEPS (sublascial endoscopic perforators surgery). All these procedures are performed on an outpatient basis! 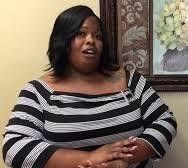 My friend recently started feeling some pain in her left leg and feet and upon consulting the doctors at Tour2India4Health, we got to know that her varicose veins have become too enlarged and thus need to be treated. I must say that the way that doctors treat each and every patient and every family member associated to him is commendable. She has been undergoing the treatment from over a month now and we can see the improvements perfectly. I have never seen the staff members and such experienced doctors giving personal attention to the care of patient and concerns of family. The main superficial vein in the leg is the Saphenous vein. Communicating veins between the Saphenous vein and the deep veins system, are called Perforators veins. It is common for women to develop varicose veins during their pregnancy. The main cause of this is due to the hormone changes in the womans body. There are increased levels of progesterone which cause the blood vessels to relax. This problem can be increased due to the fact that the enlarged womb may pressure the major veins that pass through the pelvis which results on pressure in the veins of the legs. Varicose veins during pregnancy are more likely to affect women who have an inherited tendency of varicose veins in their family. Its important to note that varicose veins may disapear after pregnancy however after each subsequent pregnancy varicose veins are more likely to appear and become more visible. For women who had varicose veins in previous pregnancies its important you take precautions if you become pregnant again.